The Anglican Cathedral in Christchurch Square. Photo from November 26, 2013. Since September 4, 2010, an earthquake and subsequent aftershocks have caused death and damage to the South Island of New Zealand. Yesterday, on November 26, 2013, Matthew McLain, Molly McLain and I had a chance to visit Cathedral Square in downtown Christchurch. Since the earthquakes first started in September 2010, I had followed the destruction here and there from North Dakota. Like many (or all) destructive events, one gets a different impression from reading about it in contrast to physically visiting it. 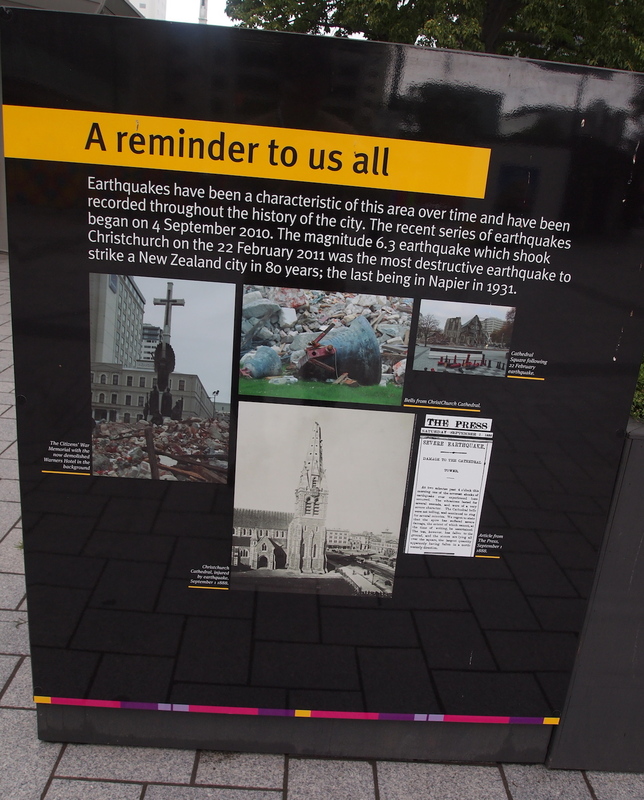 A public history display in Cathedral Square, downtown Christchurch, New Zealand. Photo from November 26, 2013. In the city’s altered centre, art, storytelling and the realm of the imagination claim a vital role. Artists Chris Heaphy and Sara Hughes have unleashed color, pattern and energy to communicate an active sense of possibility. It completely makes sense when wandering around the otherwise grey concrete and rubble-strewn urban scape of the Cathedral District. 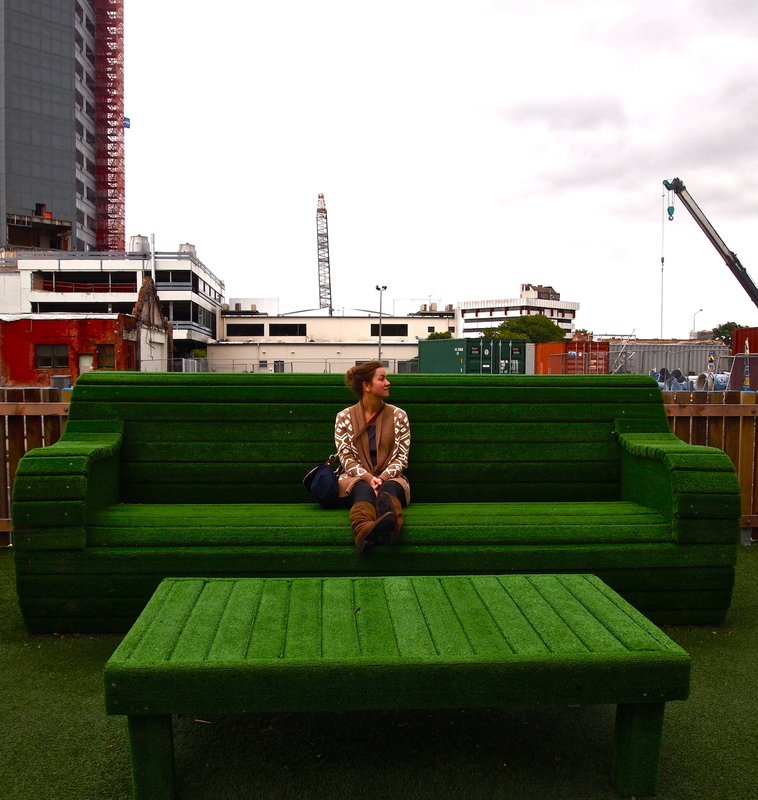 One piece of public art was a glorified living room covered in astroturf. This impressed upon me the idea of returning the Cathedral District to an outdoor living room. The large sofa, when sitting on it, points you toward the severely damaged Anglican Church. Another public piece of organic art is the botanical entry that frames the way visitors and sight-seers can view the church (and potential rehab, much of which is documented in this blog here). The three of us had a hard time finding sensibly priced lodging in downtown Christchurch, so we took to the non-city centre and eventually found a cozy little motel. I think it’s important to note here, though, that Christchurch is functioning. In the wake of the September 11, 2001 destruction, I remember Mayor Rudy Giuliani encouraging non-New Yorkers to continue visiting New York City. A couple friends of mine and I ended up taking him up on that, and we visited downtown New York City and Ground Zero in late September 2001. Public Art that impressionistically simulates an outdoor living room in Cathedral Square, Christchurch. Molly McLain is obliging the artists, and taking it all in. 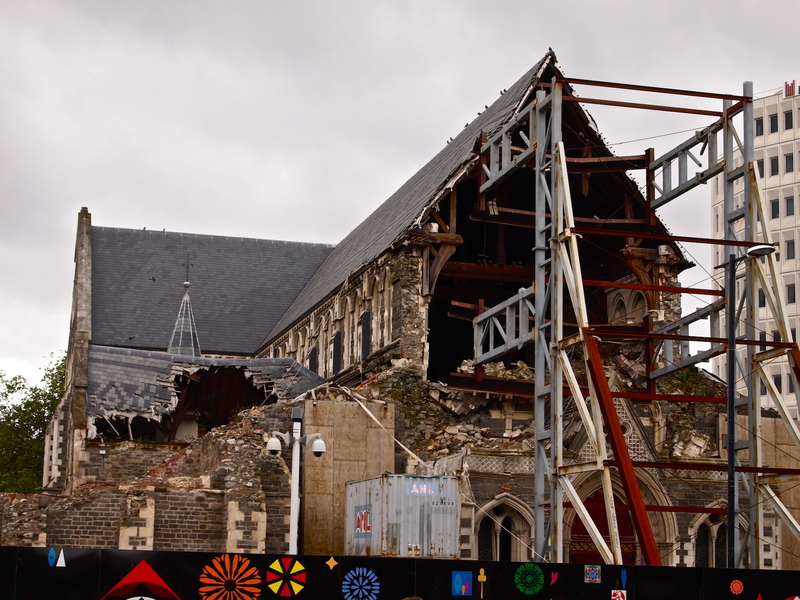 If someone was to ask me whether or not to visit Christchurch, this in the context of all the rebuilding, I’d encourage it. You might want to book additional sight-seeing to the variety of wineries and vineyards surrounding Christchurch, or the hot spring pools in Hamnar Springs, or the natural history that is the Fox Glacier or Franz Josef Glacier, or (you get the idea). We’ll continue thinking of Christchurch, and we are thankful for the artists that have been charged with and want to reinvigorate the local human spirit. This works just as well in the formal and informal sense. For example, while waiting for our out-going flight at the Christchurch airport, a young kiwi just ran up to Molly and handed her a home-made Merry Christmas card; Molly is creating her own as a response. Inspiration, or inspiring the spirit within others, is contagious that way. 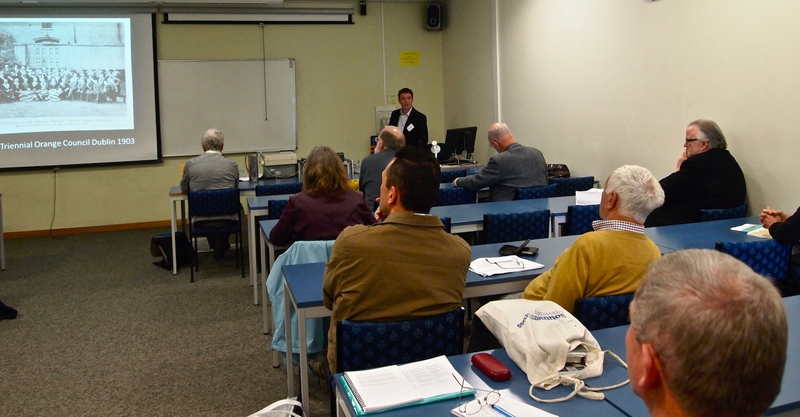 Henry Yu provides the final keynote lecture at the New Zealand Historical Association Conference. 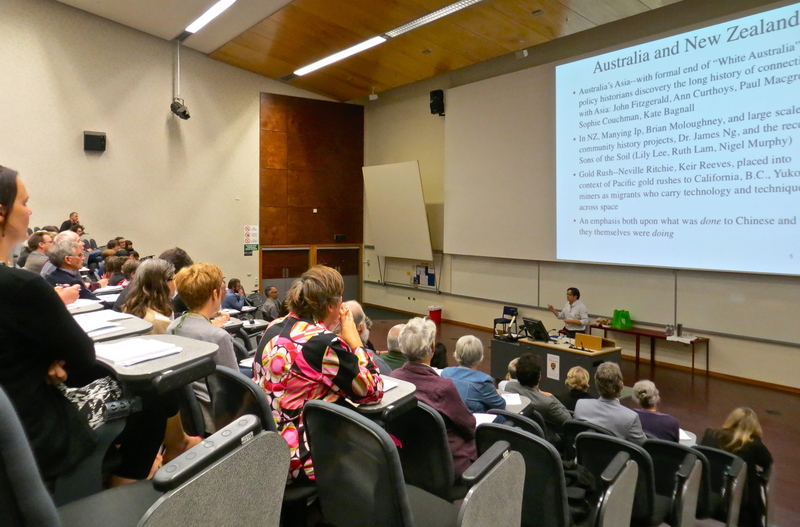 On Friday morning, Henry Yu provided the final keynote lecture at the New Zealand Historical Association conference. Yu’s lecture title was, “The Cantonese Pacific: Anti-Asian Politics, and the Making and Unmaking of White Settler Nations.” Yu talked about the 19th century Chinese migrants specific to the social history of ideas. He explained the notion of Gum San, the namesake that Cantonese migrant gold workers gave to the places they imagined themselves eventually arriving at. Gum San signified an idea rather than a place, and they would travel to these goldfields with the psyche of making it: before we can act, we must first have an idea of action. In some cases the workers returned to their homelands, or their villages, ideally with money that allotted them control over their own destinies. In other cases they always envisioned returning, but remained in their non-homeland locales throughout New Zealand, Australia, and North America. It was great to hear Yu talk about all of this. My notes from the Henry Yu talk. 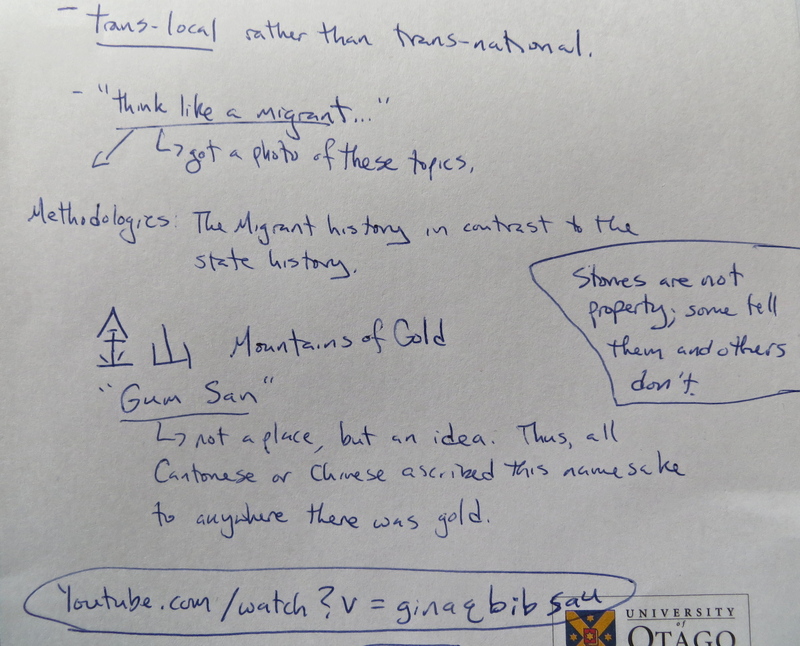 Yu’s work fills in large gaps in Pacific and world history, and I thought about at least four things during his talk. The first had to do with the Chinese graves that I remembered visiting a couple years ago while in Deadwood, South Dakota, this of the early Chinese gold miners and service industry workers in the Black Hills. The second has to do with the Chinese labor force that built large segments of the railroad throughout the American West. The third had to do with analogies to contemporary migrant workers entering the business of mineral extraction in western North Dakota. And the fourth had to do with how much easier it was for a migrant laborer to travel across national and imperial boundaries before the nation-state created elaborate bureaucracies to inhibit this (largely in the name of race and nation, at least by the turn of the 20th century). But I don’t have much time to digress on all of this because I need to get over to the Settlers Museum in Dunedin. 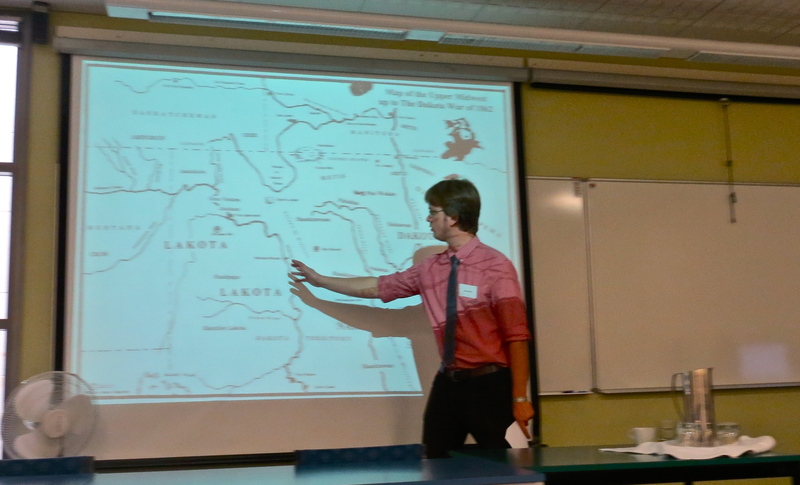 Explaining the various locations of the Dakota, Nakota and Lakota on the northern Great Plains, North America at the New Zealand Historical Association biennial conference on November 21, 2013, at University of Otago, New Zealand. Before I head off to another day of conference papers this morning, I thought I’d do a short recap of the session I attended and presented in yesterday afternoon, representing North Dakota State University and the Center for Heritage Renewal here at the University of Otago, the southern-most university in all the world. Each presenter has 10-15 minutes to work with, and this is always the challenge of presenting: it’s how to communicate a rather complex idea to an audience — in this case on the other side of the world — using the allotted time parameters. My talk must have resonated with the other attendees and presenters, including George Davis and John Moremon (we chatted a bit after the talk). I got what I came for, too: my goal was two-fold, the first to present a case-study history on one US-Dakota site of memory and mourning on the northern Great Plains (complete with the history of “official” and counter-official remembrance), and then ask Maori and Kiwi scholars to direct me to various sites of remembrance that resulted from the 19th century British-Maori wars. Of the latter, these conversations are continuing, so I’ll round out this blog post so I can get to those said conversations today. 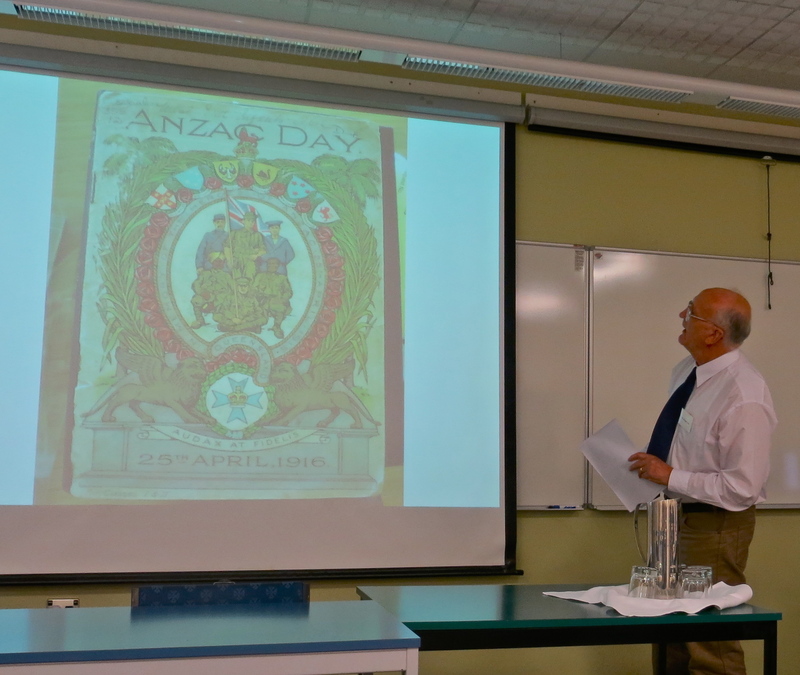 My presentation was followed by George Davis, who considered the remembrance of ANZAC Day memorials, or how memory groups conceive of the physical and mental landscapes, in this case relative to the First World War. And the final presenter came from Aussie John Moremon, who considered how the Aussie and New Zealand government helped (or didn’t help) WWII veteran Calvin Coghill’s relatives through the grieving processes after finding out that Calvin had been killed in action in the European Theatre. Geoff Watson chaired our panel discussion, dutifully keeping all of us within our time limits. George Davis explains the symbolism of the memorial wreath of ANZAC day. I’m currently sitting in on Patrick Coleman’s talk entitled “Transnational Orangeism” at the New Zealand Historical Association’s biennial conference in the very antipodes at the University of Otago, Dunedin, south island New Zealand. The Orange Order was a militant organization that rose out of anti-Catholic sentiments in Ireland in the late-18th century. The order reached back into history to grab hold of the memory of William of Orange’s victory over King James. The former was protestant, the latter Catholic. It was a battle that was couched in religious terms, not only about politics and power, but the overlap of religion, politics and power. Patrick Coleman considers the Orange Order in world history. The Orange order was global, and they established lodges throughout the world (Canada, the United States, New Zealand, Australia, etc). Patrick used the historical figure of Edith O’Gorman (1842-1919), using historical biography to explain how the ideas of this particular movement moved across the world. Edith was famous amongst her 19th century Orangeists because she escaped nun-hood, converted to protestantism, and went on to give public talks about her self-described struggle. The use and consideration of using historical biography to discuss world historical events has been a theme of several historical talks at this conference. Maya Jasanoff chatted yesterday about her work which considers Joseph Conrad and his novels as windows into the marginal territories of the global British Empire at the turn of the 19th century. So without going too much further into all of this, I’ll press “Publish” on the blog post and put my computer away to redirect my focus on this next talk. We — the global we — are in the historical shadow of global colonial settlement and struggles, and I thought it interesting how Scottish settlers imposed their image of Edinburgh on the urban landscape of Dunedin, South Island, New Zealand. I’ve heard a few shop owners in the last couple days remark on this, so I pulled a couple maps off Google Earth and loaded them up here, right below. 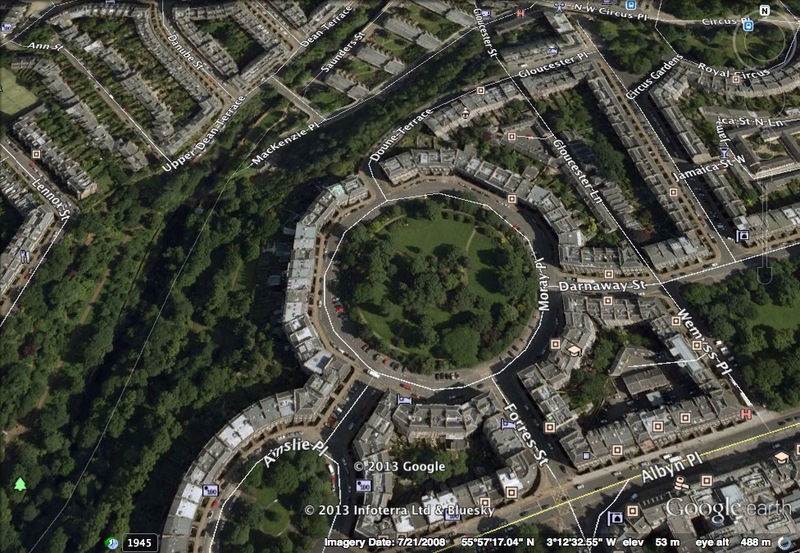 Note the similarity of the octagon, and also the common Moray Place street names. The Dunedin New Zealand colonial layer is on top of what was Maori layers of meaning. And, indeed, that is another blog post all together. The first map is of a segment of Edinburgh, Scotland. The second of Dunedin, New Zealand. Moray Place in Edinburgh, Scotland. 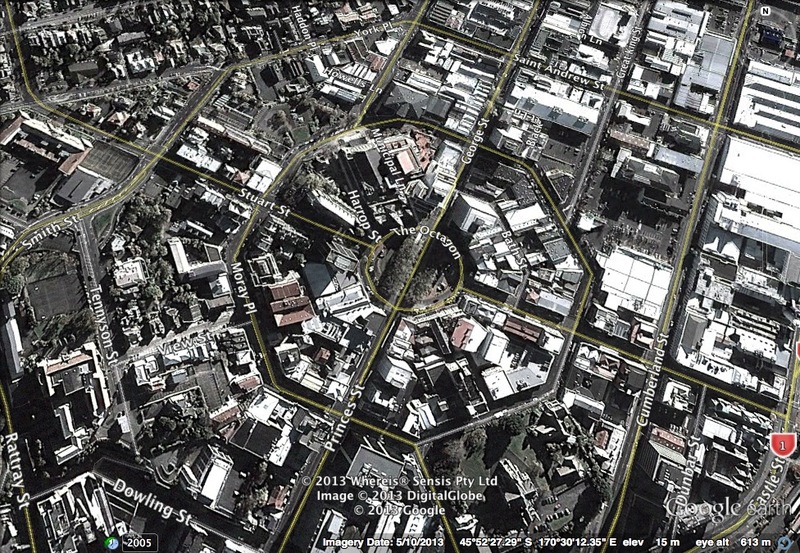 Moray Place in Dunedin, New Zealand. 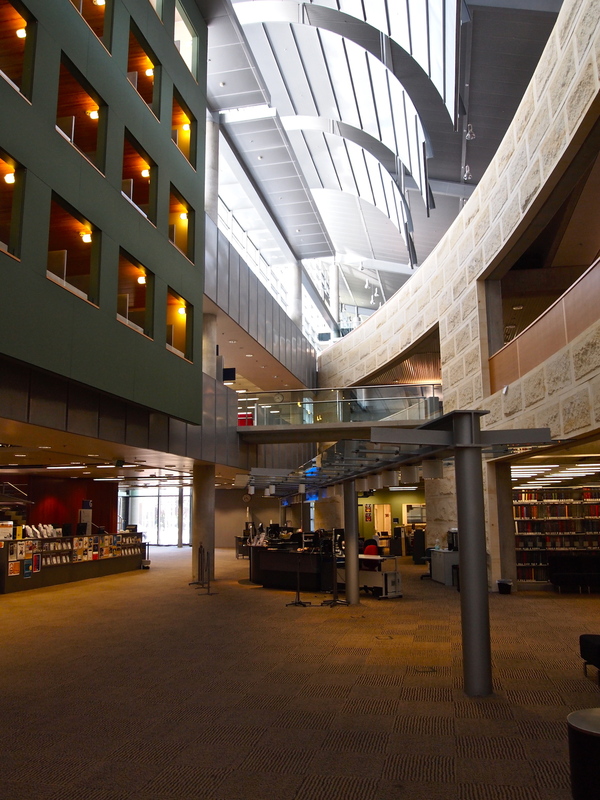 The University of Otago’s Library. Yesterday I was one of the 17 participants in a seminar-workshop hosted by the University of Otago’s Center for Research on Colonial Culture, this directed and led by Tony Ballantyne, with discussion also led by Maya Jasanoff. The day started with short introductions, and I found that I was only one of two from North America, the rest consisting of two highly trained squads of sharp New Zealand and Pacific Island historians. I assured one New Zealander/Kiwi that North Dakota and New Zealand are similar in that when someone visits either North Dakota or New Zealand, they aren’t just stopping in and on their way to a final destination. It makes a person living in either place feel important when distant company shows up. The Kiwis decided that was true, and we moved on to other topics. One of those topics concerned different ways to write or consider writing history, and in a global historical context. I mentioned something about that yesterday, but it was even more important to hear what others thought and bounce around ideas. My research trajectory is concerned with how the US-Dakota wars have been officially and un-officially remembered for the last 151 years. I was particularly drawn toward scholars who look at how indigenes have acted and managed the 18th and 19th imperial struggles in in this neck of the world. 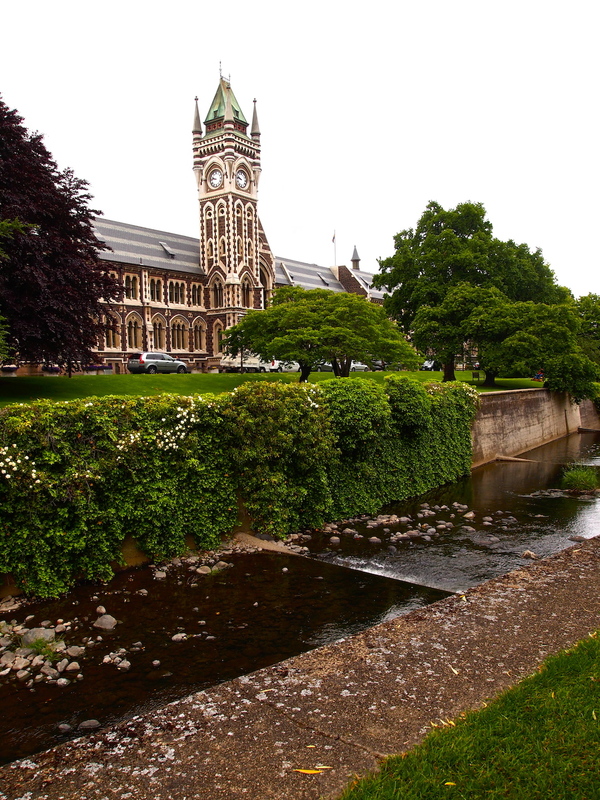 A section of the University of Otago campus. Louise Mataia, for example, is looking at how Samoans carved out an identity in the overlapping worlds of American and British “controlled” Samoa. This invariably brings up the issue of how European and Euro-American powers from the Atlantic World attempted to map and impose imperial interpretations on the Pacific islands. There are boots-on-the-ground Samoans, and then there are map-makers in some board room in London and Washington, DC who claim, with their maps, that they know what’s going on a half-world away. This conversation invariably leads to the name Benedict Anderson, and it’ll be great to keep up with Louise to see which directions her dissertation takes. Memory, or what we have remembered, is often about politics and power, and figuring out why we have remembered stuff today requires us to chart why and how it was remembered yesterday, from one generation to the next. This in turn not only invites scholars to consider what historical maps might tell us about the past, but also how local museums and the history of theatre have informed, or attempted to inform, various audiences: before the invention of radio and television, ideas were often transmitted via theatre and live performance, this through plays and opera. I better charge off to this morning’s conference, so before I end this blog post, I’ll have you know that Molly and Matthew are tracking down bungie jumping, and they mentioned something about a scenic jet boat tour. The photos below are from our scenic drive yesterday evening out to an albatross breeding sanctuary. 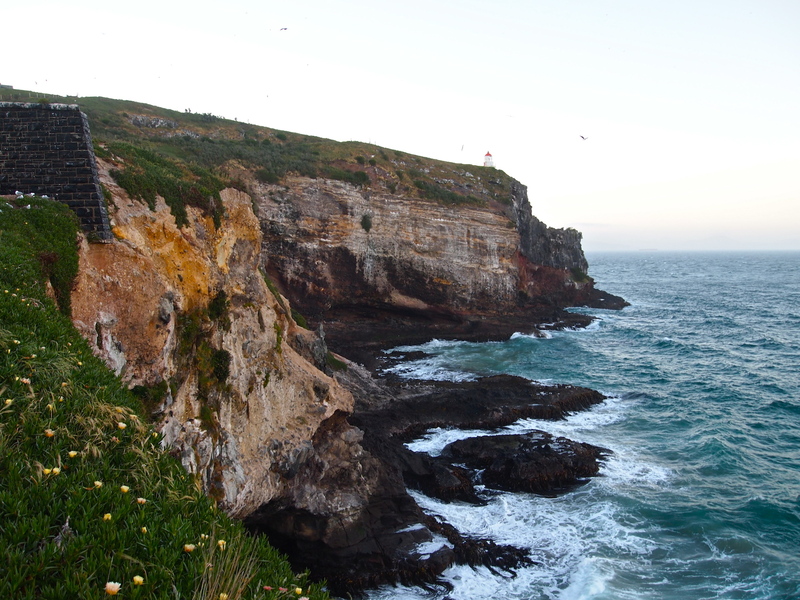 An Albatross Sanctuary just outside of Dunedin, New Zealand. Yesterday morning Matthew, Molly and I walked a couple blocks to the center of downtown Dunedin, to what I’ve been calling the undisputed octagon (because the city center was laid out like an octagon; not because it has any association with Ultimate Fighting). I learned quickly to watch for the little green man, an indicator that lets pedestrians know when it is a guarded time to cross the street. We also found a grand little breakfast shop. One contrast between NZ and ‘merica is that restaurants and cafes are, generally, a bit more spendy than the States. But this is offset by the reality that NZ servers are paid a greater wage than State-side servers, and this also means that when in NZ one is not expected to tip. Also, the breakfast was delicious. Matt had French toast and Molly and I split a breakfast of egg, toast, bacon and sausage. It was a very traditional breakfast, at least if one grows up on the northern Great Plains of North America. In many ways NZ is like a parallel universe to the English-speaking Atlantic World, which in turn gives a person pause as to the influence the 18th– and 19th– century Great British world had on the globe. This is going to be a point of conversation for the second item today, which is the Writing Histories of Empire and Colonialism, this put on at St. Margaret’s College at the University of Otago, Dunedin. 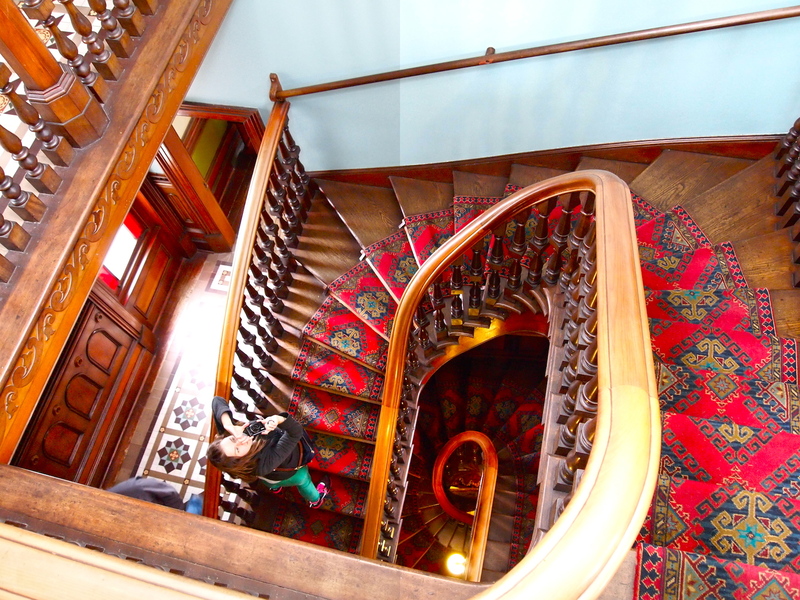 Castle Larnach stairwell, from the top floor looking down. One of the aims of this history workshop is to bat around and consider ideas about how to write solid global history. One of the potential problems with writing world history is that one is dealing with a large topic, and there is always a danger of saying nothing in an attempt to say everything. So this is why we don’t do that. Instead, a different way to go about it, at least as I’m sitting here and typing, is to 1) work in topics of 3s and 4s; 2) give the reader a personal element to fixate on; and 3) carry a theme/thesis that runs through the entire historical essay or monograph — this, arguably, can be a model for any writer’s workshop. So to return to the first blogging topic for today: I’m thinking a bit about yesterday afternoon, when we all visited, had high tea, and took an afternoon stroll at and of Castle Larnach, a late-19th century industrial Victorian “home.” While wandering through this castle, I thought about simultaneously how great a view one had from the top of the castle tower and about the excessive absurdity of this kind of built la-la land. I say la-la land because castles, in their original utilitarian form, were built as defensive positions, often in an attempt to protect the feudal lord and local populace when mean outsiders wanted to be mean to the said lord, baron and locals. 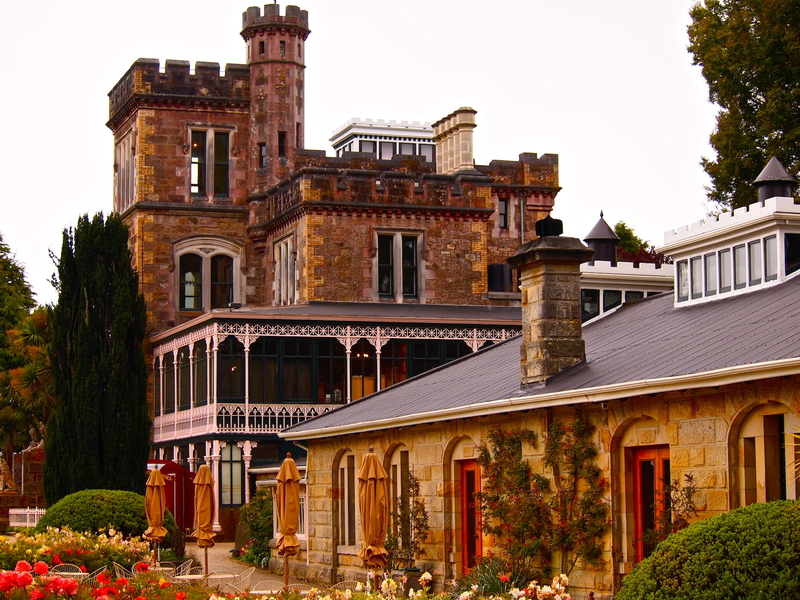 In the case of Castle Larnach, this banker and politician made a ton of money off the New Zealand and Australian gold fields, and then decided to conceive of himself as some kind of varietal noble. It reminds me of super late-19th century castles in America, such as the James J. Hill home in St. Paul, Minnesota. It is these sorts of industrial wealth concentrations that, after the turn of the 19th century, Progressive Republicans such as Theodore Roosevelt thundered against, or sought to break up. (Out of this period in world history, we get self-validating, hyper-dodgy theses that the über-rich came up with, such as Social Darwinism and the Social Gospel — we’re rich because either nature or God made us rich). The notion here, though, is to consider how or if a world historical theme is reflected on the local level. Then, in theory, readers might think of their own regional histories as being both local and global. 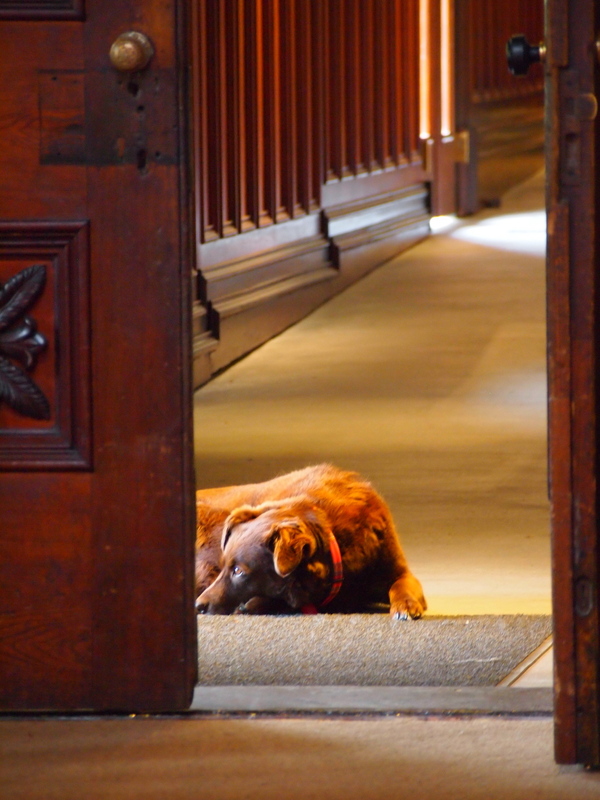 Fern, the exhausted and super friendly castle dog at Castle Larnach. Nothing gets by Fern. Not that she cares, though. Another point to consider is that the James J. Hill home, and this Scottish castle in Dunedin, could not be sustained for any length of time, at least not by a singular family. Today they have turned into public historical enclaves, administered by private or public entities, and the public has access to them in ways that they wouldn’t have in their original historic context. Anyhow, and moving along, I’m excited to get after this first day’s seminar/workshop. All of the world history workshop attendees are required to read three different essays which, of course, I did on the flight over. The readings include Linda Colley, The Ordeal of Elizabeth Marsh (2007), Maya Jasanoff, Liberty’s Exiles: The Loss of America and the Remaking of the British Empire (2011), and Tony Ballantyne, “On Place, Space and Mobility in Nineteenth-Century New Zealand” in the New Zealand Journal of History, 45, 1 (2011). But enough about all this. It’s almost 8:00AM Dunedin time, and we need to track down this thing in Australia and NZ called breakkie.